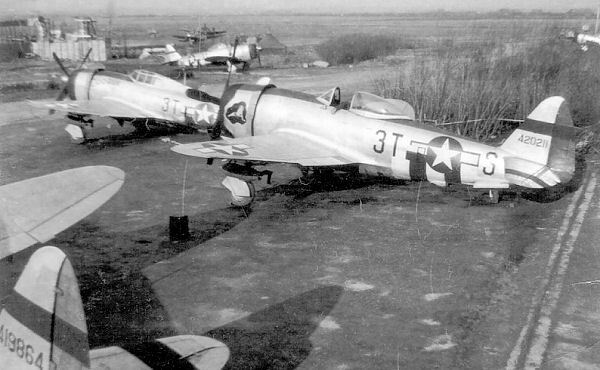 This P-47 Thunderbolt was flown by the 22nd Fighter Squadron — which included 1st Lt. Frank Fazekas. Photo courtesy Ryan Wubben. 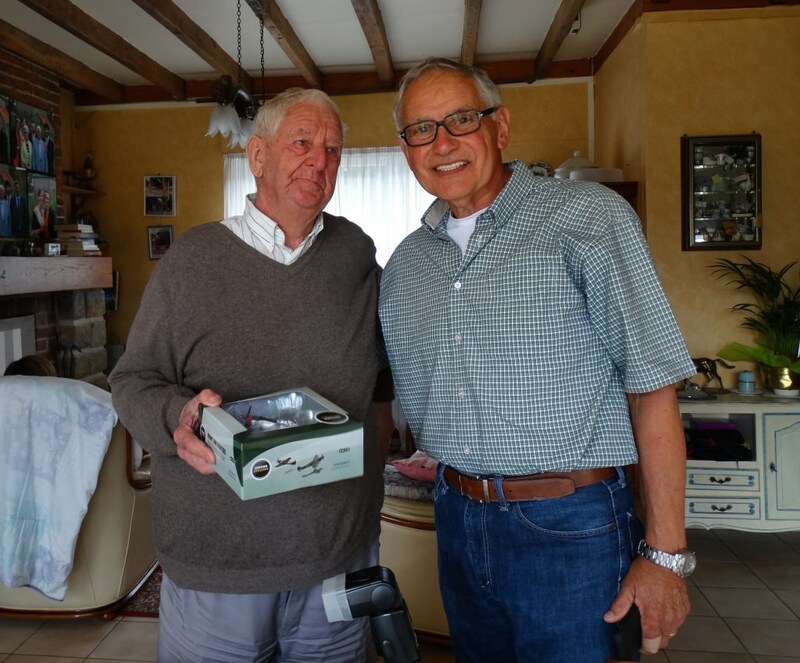 Frank Fazekas Jr, right, son of the lost pilot, visits with Marc Cooche, who grew up on a farm adjacent to the crash site and witnessed the wreck of 1st Lt. Frank Fazekas’ P-47 Thunderbolt on May 27, 1944. Photo courtesy Danielle Roubroeks. Leslie Eisenberg, third from right, guides the clearing of corn above the likely resting place of Frank Fezekas, whose fighter plane crashed in the farm field in France in 1944. Photo courtesy Danielle Roubroeks. Leslie Eisenberg guides digging while watching for the subtle changes in the color of the soil that would mark the crash site. Photo courtesy Ian Thomasgard. 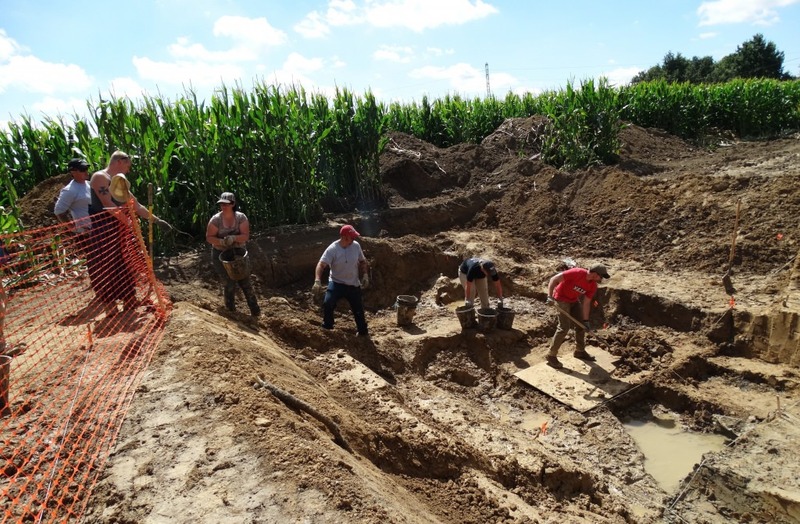 The team hauls buckets full of mud and debris up from the bottom of their excavation pit. Rain and thick clay slowed progress. Photo courtesy Danielle Roubroeks. 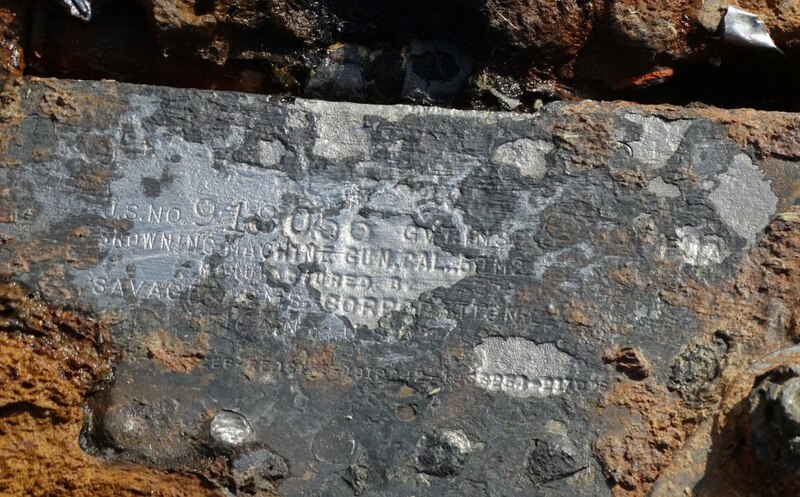 One of the P-47 Thunderbolt’s eight .50 caliber machine guns, unearthed as it was driven into the French clay at the angle of the plane’s impact. Photo courtesy Danielle Roubroeks. Serial numbers on the machine guns recovered from the excavation matched records from the plane flown by 1st Lt. Frank Fazekas. Photo courtesy Danielle Roubroeks. 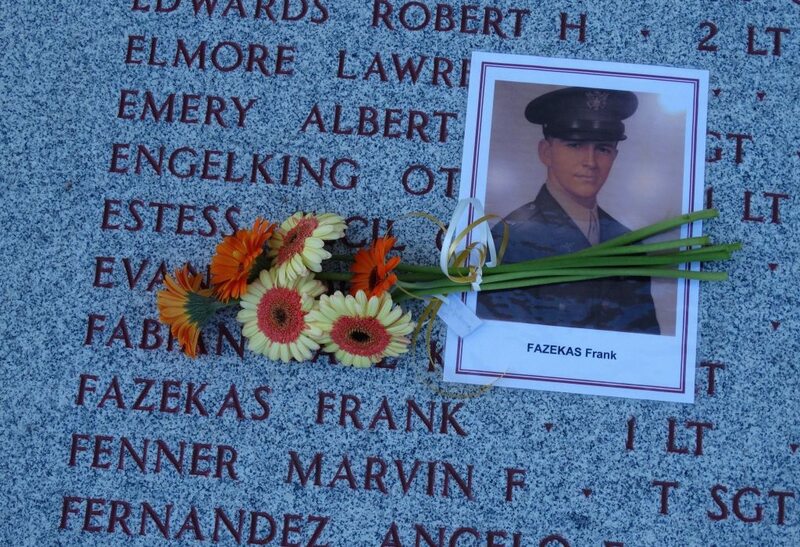 Fazekas remains listed among the missing at Ardennes American Cemetery in Neupré, Belgium. Photo courtesy Danielle Roubroeks. On May 27, 1944 — little more than a week before the D-Day invasion — 1st Lt. Frank Fazekas was at the controls of his P-47 Thunderbolt when it fell from formation over northern France, spiraling into a farm field near a village called Buysscheure in the Nord Pas-de-Calais region. German soldiers — maybe from an air defense artillery unit that shot the plane down —surrounded the still-smoldering site, according to witnesses. Fazekas’ wingman, certain the crash was fatal, gave a brief statement when his mission was complete. And, eventually, the farmer closed up the ground and replanted, likely leaving the remains of the pilot, dead at 22 years old, entombed with his plane. This summer, in a unique collaboration with the U.S. Department of Defense (DoD) and an academic institution, a team from the University of Wisconsin–Madison recovered wreckage and possible human remains from the crash site — confirming the plane to be the Thunderbolt Fazekas was flying and the field as his resting place. 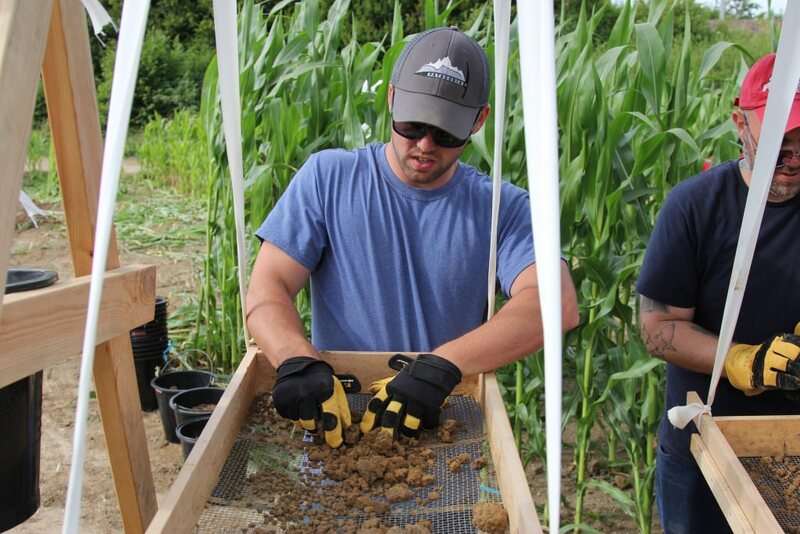 A group of about a dozen students and staff from UW–Madison, the University of Hawaii–West O’ahu and personnel from the Defense POW/MIA Accounting Agency (DPAA) spent approximately three weeks digging and sifting in a corn field in search of the crash site. But that work began only after the expedition was nearly called off. 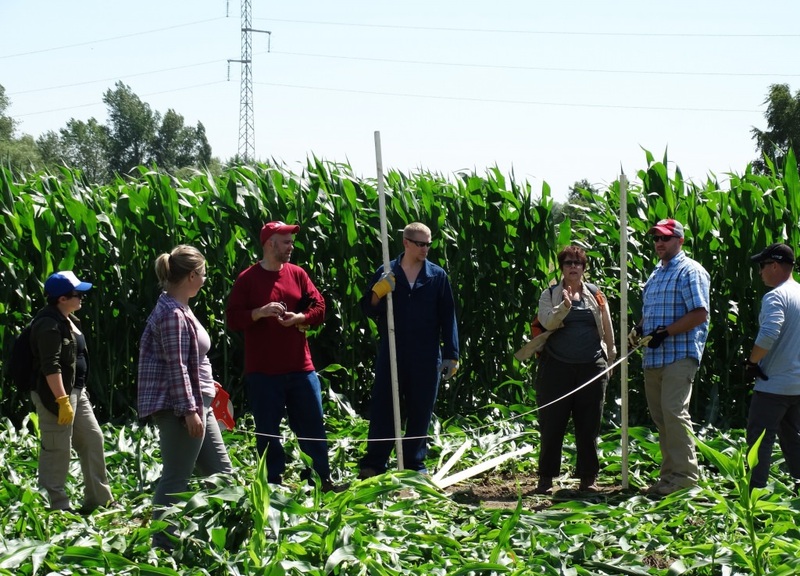 In April, case research specialist Sam Soderberg assisted a technical group from Germany in Buysscheure using ground-penetrating radar in a field identified by Marc Cooche, an 84-year-old man who grew up in a nearby farmhouse and witnessed the plane crash at the age 12. The radar turned up no sign of the wreckage. Without conclusive evidence they had the right spot, Konsitzke says, the entire effort was nearly canceled. “We almost called it all off, but a few days later, researchers at DPAA found a photo taken by a British reconnaissance flight just two days after the crash,” says Konsitzke. The image showed the crater from the plane’s impact just meters away from the field initially surveyed using ground-penetrating radar. The German team had made their survey on the opposite side of a road that, when built in postwar years, had moved north past the site. Overlain on modern aerial photos and maps, the image gave the search a new and more accurate target, and U.S. military officials and UW–Madison administration went to work obtaining permission from landowners and the French government for the group to break ground this summer. In late July, a UW–Madison contingent that also included recent graduates Claire Steffen and Ian Thomasgard, and student Kevin Scheidt, project emergency medicine director and Med Flight Medical Director Ryan Wubben, and biotechnology outreach specialist Tom Zinnen, arrived in France. They were joined by William Belcher — a DPAA lead forensic anthropologist and University of Hawai’i–West O’ahu archaeology professor who earned his doctorate in anthropology at UW–Madison — with a group of his students as well as a DPAA civilian and active duty service members who assisted the UW team search. A Belgian volunteer named Danielle Roubroeks provided invaluable help interpreting as the Americans interacted with locals. 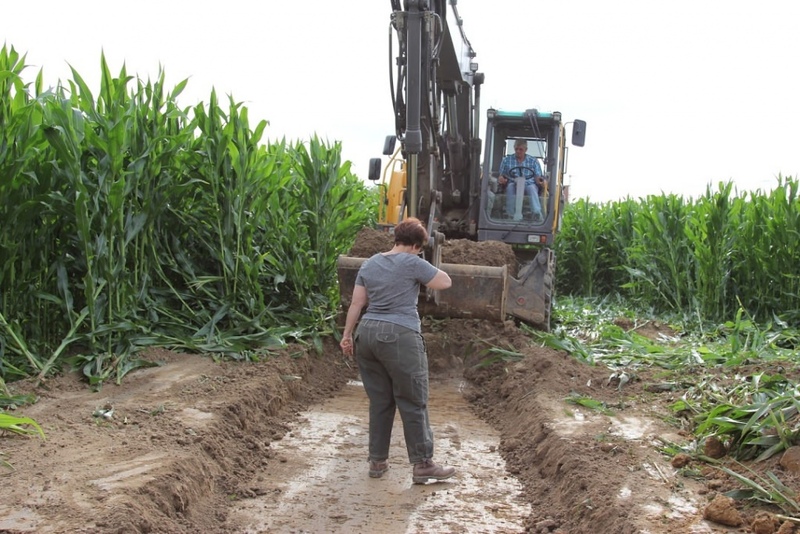 The team cleared the corn from an area roughly 60 feet by 80 feet, and Eisenberg worked with a backhoe operator to dig exploratory trenches that further narrowed their search. She was looking for a change in soil color and texture that would signal the crash location. Once located, the team had to excavate the fill that capped the three-to-four meter deep crater. 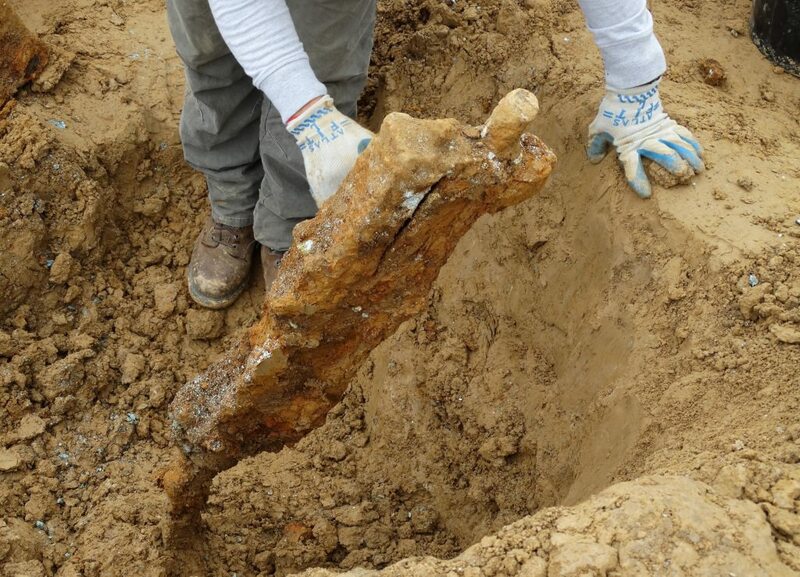 It was several days of digging later — and just after Fazekas’s son, Frank S. Fazekas, had joined the UW excavation team at their invitation — that they found two sets of .50-caliber aircraft machine guns standing upright, like pilings driven meters down into the clay by the force of the impact. Careful cleaning revealed two matching serial numbers. The group turned to a careful sifting of the dirt for the pilot’s remains, focused on the area between the Thunderbolt’s guns that were mounted on each wing of the aircraft. After another week of turning up pieces of seat upholstery, metal and rubber from the self-sealing fuel tanks, they found possible bone material. Using its experts and technology similar to that employed by the UW Biotechnology Center, DPAA and others at DoD will conduct forensic analysis hoping to recover DNA from the suspected remains and make a conclusive identification. In the case of a positive identification, the family hopes to reinter the pilot with his wife, Frances, in Arlington National Cemetery. UW–Madison hopes to be able to lend its growing expertise to similar search operations in the future. Whatever the outcome, the experience was a deeply moving one for the academic teams, who will tell their story on campus at Wednesday Nite @ the Lab on Dec. 7. “What Frank told us was important was that his dad brought together all these people from around the world to a small community in northern France,” says Soderberg. The Americans were approached in the street and restaurants of Buysscheure by survivors of war-torn Europe and their descendants with stories and memories and kind words about a life lost so long ago.